The Werth Chromatic Focus Point sensor is a highly accurate optical distance sensor that is largely insensitive to surface condition.A typical application is determining flatness by scanning quickly using the sensor’s own measuring range. Because of its working principle, the sensor is not significantly affected by the contrast or reflective properties of the workpiece surface. This makes the CFP nearly independent of the surface condition, so it can be used with transparent, diffusive, and highly reflective surfaces, such as those found in toolmaking, electronics manufacturing, and precision optics.In addition to embossing dies, coplanarity of solder points on plug connectors, and highly accurate watch plates, the CFP measures functional optical surfaces such as lenses or mirrors. The linear Chromatic Focus Line sensor (CFL) uses the same measurement principle to capture the entire workpiece surface in 3D. Various sensor heads are available for different precision, surface angle, and measurement speed requirements. For high precision requirements, it can be combined with the Werth VideoCheck® UA multisensor coordinate measuring machine. 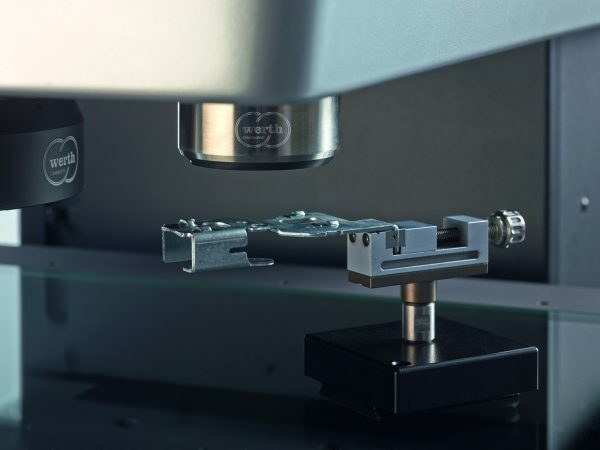 This measuring machine achieves a maximum permissible error of MPEE1 = (0.15 + L / 900) µm.